The Bar is open seven days from 10:30am daily. Apart from a well stocked bar at affordable prices you can check out our Off Sales Rigger and Flagon Club. Five large TVs for watching your favorite sport, news or TAB Racing, Seven stand alone Gaming Machines if you want to have a flutter. 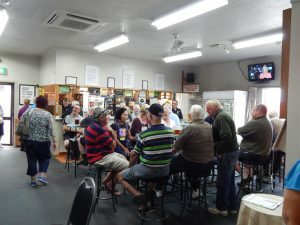 The Bar is a lively place with lotteries, raffles, competitions and other exciting events taking place every week. No matter if you want to try your luck in the Gaming Lounge, watch the All Blacks match on the big screen,or just relax with your friends, you will enjoy your time here!